We decided to go on a lovely tour, with their Globe Trotting Menu & Beer Pairings. 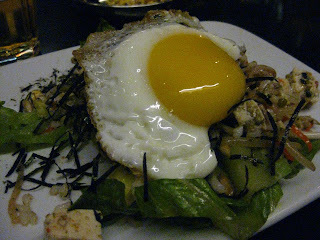 Enter text here.KOREAN RICE SALAD fried egg atop chopped lettuce, brown rice, soybean sprouts, enoki mushrooms, nori, daikon radish, tofu, and sunflower seeds in a spicy sweet sesame dressing. INDIAN SEMOLINA CAKES crispy pan fried cakes of utma semolina with toasted cashews, peas, tomato and spices; topped with tomato chutney. Enter text here.MOLDAVIAN MEATBALLS ground beef & kasha meatballs simmered in a sweet and sour tomato sauce with dill sour cream. 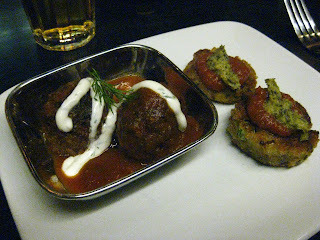 The Meatballs were super yummy... the cakes, just OK. Enter text here.MASSAMUN CHICKEN CURRY traditional Southern Thai curry with chicken, red yam and mushrooms, simmered in a coconut milk and spices of Muslim Indian influence. 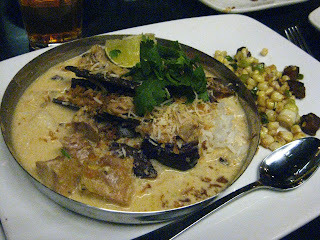 Enter text here.VIETNAMESE CORN wok cooked medley of fresh corn, spring onions and glazed pork belly. The curry was amazing, the corn was just OK. A little spicy for my tastes. All in all, restaurant was a solid B. Good for a try, but not somewhere I need to return. However one thing to note, the beer pairings with the food were incredible!